Last week I was fortunate to attend one of the most impactful conferences I have ever been to. It’s called CaboPress and it is put on by Chris Lema, who has been a mentor and guide to me over the last year and a half as I have been building my company. Every year Chris puts together a group of people, mostly from the WordPress ecosystem though a few of us not involved in WordPress as a business, to go to Cabo San Lucas to spend a few days doing morning sessions and then free afternoons before dinner in the evenings. It’s a loose structure that seems to work well, with enough focus to guide conversations but also enough freedom to get work done and determine your own destiny and get out of the conference what you need. One great thing about CaboPress is that it is different from almost all of the other conferences I go to. When I go to marketing conferences these days, I do not usually learn much. That’s totally fine and something I have come to accept, as marketing conferences are great for my business. For CaboPress, though, I went to learn. I went to be around other entrepreneurs who are dealing with similar issues as I am, but who may be further along in their journey or have other areas of expertise than I do. I went in with pretty open eyes, open to where the conversations would take me, but I also had a few specific questions to answer in my business. I was able to accomplish those by speaking with a few specific people and getting some very actionable strategies and tactics as well that I can directly apply to my business, but the real insights came off the back of conversations that occurred after the morning discussions in the pool. Looking back on the week, I don’t know that sharing the specific tactics I learned will be useful to many, as they are very specific to where my business is in its evolution. I’m happy to share them with others as I implement them and see progress. The lessons I took away that will serve me moving forward are much more interesting to me and probably to you as well. Teach someone to fish, don’t give them a fish, right? I have long been a very transparent person, sharing anything and everything with anyone. Maybe this is just an effect of spending too much time on the internet, but I think it gets at a deeper need that all of us have to be known by others. It is easy as an entrepreneur to feel alone, to feel isolated. And further isolating ourselves because of the false narrative that no one can or does understand what you’re going through only leads to bad situations. I’ve been there, and I don’t want to be there again. During the first two days, there were discussions about mental health and being an entrepreneur. One evening there was even a panel (I did not attend because I am not a parent) given by entrepreneur parents for fellow entrepreneurs with parents. During a session facilitated by Sherry Walling (@zenfounder) in the pool one morning, it was amazing to hear other entrepreneurs say that they too at one point discovered that they had built the wrong business and were not happy. Others said that they struggled with depression or had been experiencing certain levels of burnout for a while. These statements by others were super impactful because it made me realize I am not alone. I also found that maybe I need to seek out a group of entrepreneurs that I can go deep with, not about business practices/strategies/tactics per se (though those may come out as well), but more to be involved in each other’s lives and businesses on the personal level. Thanks Sherry and Chris for giving the space for that transparency within a safe environment. The first night of the conference, Chris reminded all of us that he had every person in the group (50+ of us) together purposefully. He encouraged us to be open to criticism during the week and instead of defending ourselves, to ask further questions to try to understand their perspective. For the first year and a half of Credo it was a product company. I was building a marketplace. I had a fully functioning marketplace minus processing payments (and that was coming up next). But I realized that this was not furthering the needs of my customers. Over the last six months Credo has been morphing to a services company without me realizing. At first I was like “Yes of course!” but as I asked more questions and thought about it I realized that no, I was not at the right dinner. This was a light bulb moment that changed my focus for the rest of the trip. Be open to others questioning your business, even the basic tenets of it. You never know. As a marketer, one of the things I always ask businesses is “Who is your ideal customer?” I found myself asking this of both product and services people this week as we discussed marketing and their business’s needs. During an afternoon of hanging out with Tony Perez and Dre Armeda of Sucuri Security and Brett Cohen of Emagine, I realized that I do not have well defined for Credo who we provide the best service for. I know who we provide the best service for on the agency side, but I have not defined the type of company we help best on the business side. I started thinking broader about it, beyond just “ecommerce companies”, and have started going deeper into business budget/size/marketing team size and more. Other than not realizing that my company had shifted from a product company to a services company (and necessarily so), this realization helped me see why some of my work to grow Credo has felt less effective than I thought it should be. I’m just starting this process, but have some great ideas for where to start. Thanks Tony, Dre, and Brett. I alluded to this at the top talking about being around people in similar mindsets in business, but it deserves a deeper look as everyone at CaboPress was incredibly smart, nice, and helpful to everyone else. At conferences like CaboPress, there is a necessary mix of people who have been there every year and those of us who are new and not as well connected into that world. And at most conferences like this, people tend to just go hang out with their friends. This did not happen nearly as much at CaboPress as other conferences I have been to. Part of this is because Chris encouraged people to not just go to dinner with their friends, but also because we were all there to help and learn from everyone else. Everyone had a different background and perspective, and you would actually get way less from the conference if you just hung out with your friends. 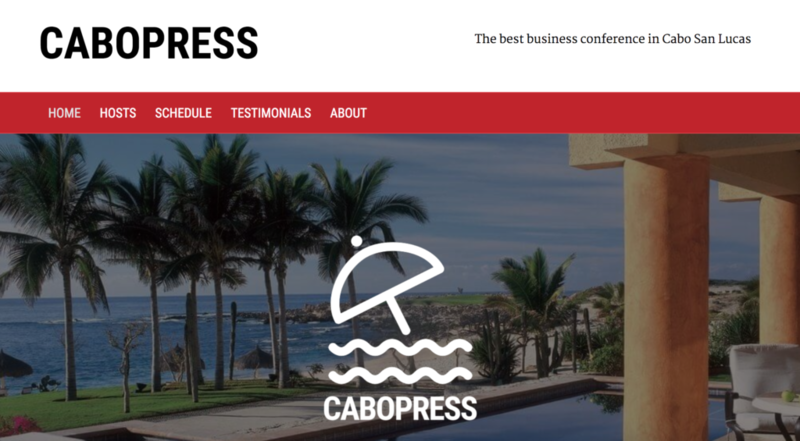 I feel incredibly fortunate to have been invited to CaboPress because it gave me unparalleled access to so many incredibly smart and successful people who I can now consider at least acquaintances and business associates if not friends as well. I was especially reminded this week how important it is to be engaged where you are instead of distracted by things elsewhere. The first two afternoons of the week, I spent a few hours in my room each day on my computer doing Credo work. While I needed to do it to be a responsible business owner, I also found myself becoming distracted by things online and in my inbox instead of out engaging with others. As soon as my mission-critical duties were done each afternoon, I made myself go to a central location where I knew I’d run into others to have conversations with. I purposefully did not bring my wife with me to CaboPress, even though spouses/partners were invited and some people brought theirs. I noticed over the week that those who brought spouses who were intent on a vacation ended up being less involved in the conference than those who brought a spouse who was engaged in the conference as well. I have also seen this at similar conferences I’ve been to and run, and it makes me wonder about the best way to structure a conference set up as a mastermind. I think I have my answer. Finally, running a business can be really draining and tough. I saw many fellow attendees who have also struggled and are currently struggling with their businesses, for many different reasons. A few were even brave enough to admit that they no longer know what they enjoy outside of running their business, and some days they don’t even really like their business. On Thursday afternoon I made it a point to go to the pool and be around others. Sure, we ended up talking a good amount of business but it also devolved (as more drinks were consumed) into a great time of conversation and fun out in the sun. Business doesn’t have to be hard. Sometimes entrepreneurs think that if things are going well, then something must be wrong. I believe that we sometimes end up causing our businesses more problems by trying to fix things that really shouldn’t be messed with. Part of this is the nature of being a certain type of entrepreneur, but I also wonder if some of it is because we forget that business is supposed to be fun and we feel bad when we’re having fun with it. I recently put this reminder on my desk at home, and I was reminded fresh of it this week. Thanks for putting together a great group and a great week, Chris. It’s had a huge effect on me and my business. I look forward to hopefully joining CaboPress 2018 as well!